Why rent stinky, disintegrating bowling alley shoes when you can invest in your very own pair of game-changing shoes? Only a few reliable companies make quality bowling shoes, and they have introduced models that are comfortable, stylish, and priced right. We have found the 10 best men’s bowling shoes and compiled all the research and reviews into one list. It’s a must-read before you buy your next bowling shoes! Brunswick’s founder wanted to make bowling and billiards accessible to everyone. 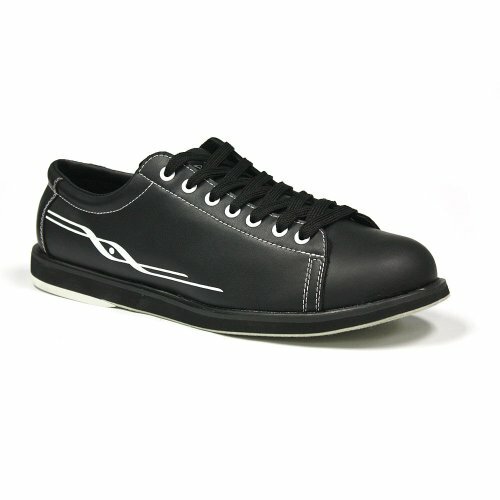 Today, the company designs quality bowling shoes and other accessories. The Brunswick Men’s Warrior Bowling Shoesare an example of the company’s attention to detail. They created this lightweight, budget-friendly bowling shoe to be comfortable. With its Komfort-Fit construction, a full cloth lining interior with a padded tongue and collar cushions your feet throughout your bowling game. With Flex Slide Technology, both outsoles are designed for the slide, making it perfect for either left-handed or right-handed bowlers. Customers rave that these shoes have no break-in period, so you can start your game as soon as they arrive. The Warriors also hold up well over the years, so you can enjoy your shoes without having to worry about replacing them. Some customers have complained that the rubber sole can make sliding a little awkward at first, but this is relatively minor. Your stride will adapt to the shoe within a few games. They do run large, but they are narrow. You may have to order a size up from your normal bowling shoe if you have wide feet. The Brunswick Men’s Warrior Bowling Shoes are our choice for the best men’s bowling shoe. Geared towards professionals, the quality footwear is comfortable enough for new bowlers as they are learning the sport. Dexter Bowling has been in business since the 1950s. Their first products were boat shoes, and they have since expanded into a premier footwear manufacturer. Dexter offers selections for every type of bowler, from the professional to the amateur. The Dexter Men’s Ricky III Bowling Shoeshave the appeal of a tennis shoe while retaining the strength of a bowling shoe. With a synthetic leather upper and a padded tongue and collar, the Ricky III is a comfortable shoe with a fabric liner to help your feet breathe during your game. The outsoles have S8 slide soles on both shoes so that you can experiment with your style. 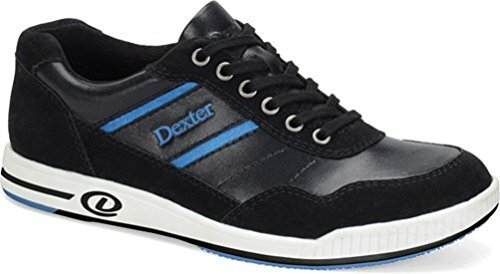 The Dexter’s Men’s Ricky III Bowling Shoes are true to size, but they have a narrow fit. The universal slide soles on both feet can be troublesome for bowlers who are right or left hand dominant. Some customers have complained that the front slide toe wears down after consistent use, and the stitching fails within a year of use. The grommets at the top of the shoe break occasionally, but this does not alter the fit of the shoe. Bowlers with wide feet can have issues finding the perfect fit in a bowling shoe. Dexter designed the Dexter Turbo II Wide Width Bowling Shoe for players with wide feet to take the guesswork out of sizing. With a sleek design inspired by traditional bowling shoes, this black-and-white model has a synthetic upper that holds up well. The grommets are reinforced with metal, preventing them from snapping. The fabric-lined interior, as well as the padded collar and tongue, add more comfort. A roomier toe box than other models also contributes to the coziness of the shoe. The Dexter Turbo II Wide Width Bowling Shoe has a comfortable insole, but it is not meant to be removable. The manufacturer glued in the insole, but some customers who need more arch support have removed it successfully, with a little patience. The Turbo II is large and wide enough that it can accommodate another orthotic insert if you need it. The rubber outsole with a raised heel can make sliding difficult. However, if there is no slide to your game, this budget-friendly, comfortable bowling shoe will be perfect for you. The sporting company with a long-standing partnership with Brunswick Bowling, Strikeforce Bowling manufactures materials and accessories for a variety of competitive sports. Their popular model, the STRIKEFORCE Men’s Flyer Bowling Shoe, has a classic style, but it is comfortable enough for any game. 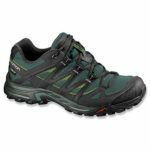 With a synthetic upper, the shoe has Komfort-fit construction. The cloth lining inside helps your feet slide in smoothly. 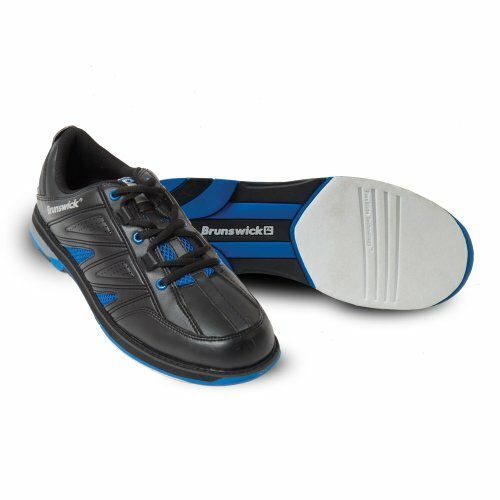 With a padded tongue and collar, as well as a comfortable insole, the Flyer keeps your feet happy while you are bowling. Available in wide sizes, the STRIKEFORCE Men’s Flyer Bowling Shoe does run small and narrow. You may have to order a larger size to get the right fit. The shoes are universal, so they do not favor right or left-handed bowlers. Some enthusiasts have complained about this feature since the rubber outsole can stick around the heel. The slide doesn’t cover the whole toe, so this can cause some issues with your form. However, the STRIKEFORCE Men’s Flyer Bowling Shoe is a well-made, budget-friendly shoe that appeals to bowlers with flat feet. Most bowling shoes today are designed with universal slide, meaning that you can use them for either right- or dominant left-hand bowling. Finding right-handed or left-handed bowling shoes can be difficult. 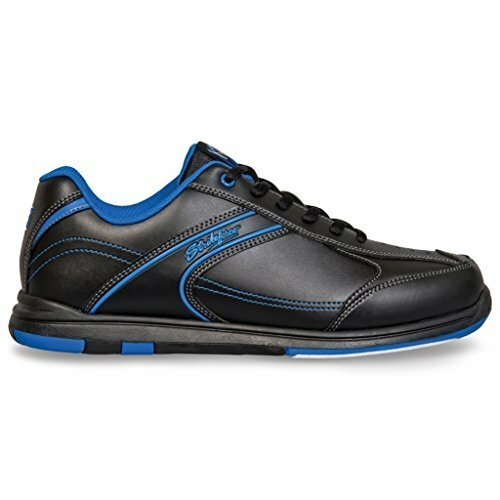 Dexter Men’s DX22551 100-P Pro-AM Right-Handed Bowling Shoes is a moderately-priced shoe designed for right-handed competitive bowlers. The S8 microfiber felt sole on the bottom of the left shoe suits only right-hand dominant players. Dexter’s DX22551 has durable rubber outsole has a defined heel to help stop your slide at the right moment. The synthetic upper forms to your foot for a snug fit and the padded tongue and collar make playing in competitive games more comfortable. There have been some complaints that the right sole peels after repeated use, but this only becomes an issue if you are using your shoes more than two to three times a week. With regular use for bowling shoes, some reviewers have complained that the stitching fails within a year of wear. 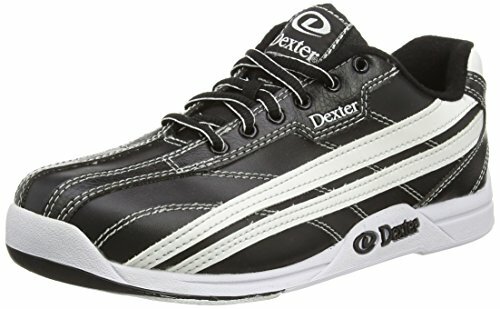 Despite these quality issues, the Dexter Men’s DX22551 100-P Pro-AM Right-Handed Bowling Shoes are a durable shoe designed for your bowling style, not the other way around. Brunswick is a trusted name in bowling shoes. 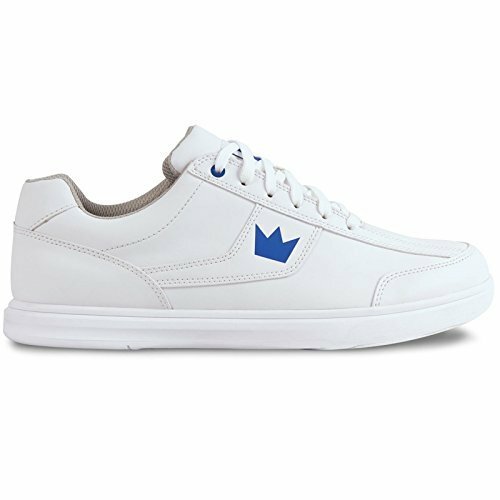 The Brunswick Edge Men’s Bowling Shoe looks like a pair of sneakers with the characteristics of a bowling shoe. Perfect for the casual bowler, it runs wide for a roomy fit. It is in the universal slide style, with the slide soles on the bottom of both outsoles. Since they look like casual shoes, Brunswick constructed the Edge for comfort. Their quality build and comfortable interior will make you forget that you are wearing bowling shoes. There is a mild breaking-in period with the Brunswick Edge. It takes a few games to break in the soles: until then, the slide is inconsistent. The synthetic leather upper doesn’t breathe as well as other models, but this isn’t an issue if you are only a part-time bowler. The soles usually wear down within a year of regular use, but their price fits into any budget. They will pay for themselves (in comparison to renting your shoes) in less than a season. Only one-tenth of the population is left-handed, so shoes suited for left-handed bowlers are less common than other designs. Much like some right-handed bowlers prefer to wear shoes suited to their own style, the same goes for left-handed bowlers. 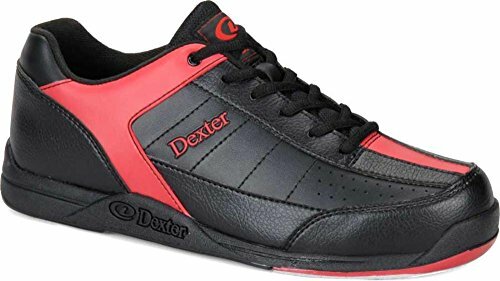 Dexter created their Dexter Men’s David Bowling Shoes for Left-Handed Bowlers with an S8 slide sole on the right shoe helps left-handed bowlers into their strike. These well-made shoes have micro Aero grips on the left shoe and a defined heel for stopping. 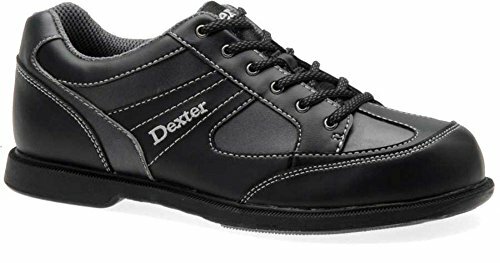 Dexter Men’s David Bowling Shoes for Left-Handed Bowlers have a durable leather upper, so there is a mild breaking-in period. For those who may need more cushion, the insole is removable. The Davids are true to size, but they do not come in wide sizes. Unlike most bowling shoes, that come with a universal slide, the Dexter Men’s David Bowling Shoes are a moderately-priced option for left-handed bowlers only. Bowlers Superior, Inc. manufactures bowling accessories and shoes for rent or purchase. 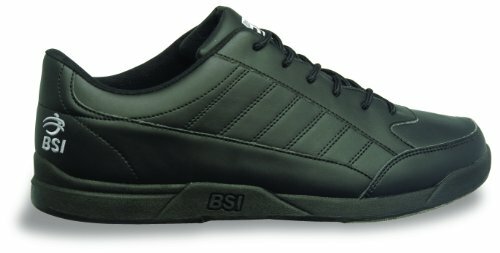 The BSI Men’s Basic 521 Bowling Shoe is a comfortable, lightweight shoe with a synthetic upper for durability. They are some of the most comfortable bowling shoes you can wear, with a soft interior and a cushioned insole. The universal microfiber felt on both soles help you experiment with left-handed or right-handed bowling. The BSI Men’s Basic 521 runs true to size, but they run large. There have been some complaints that the microfiber soles have a poor slide, but this is easily remedied with sliding powder until they are broken in. The synthetic upper stretches, which can alter the fit. This will only cause a problem if you like a snug fit. The tongue can slip down after lengthy wear. 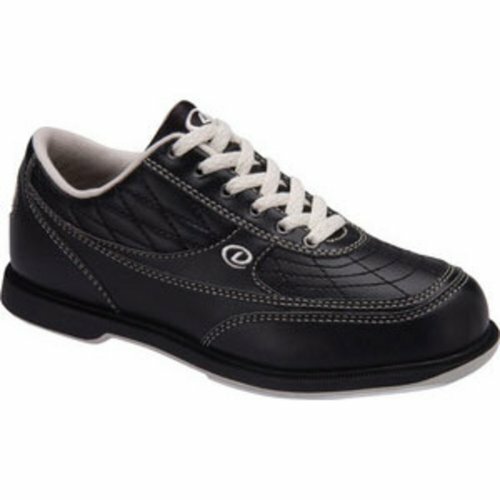 Despite its few drawbacks, the BSI Men’s Basic 521 is a well-made, comfortable bowling shoe crafted for any bowler. 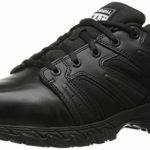 Pyramid Bowling Shoes manufactures men’s, women’s, and youth bowling shoes for people of any age who love the sport. With classic and athletic models, you can find any fit for your game. The budget-friendly Pyramid Men’s Ram Bowling Shoe is known for its comfort and quality construction. With universal microfiber felt soles, any bowler can use them. The reinforced metal grommets make lacing smoother, and the rubber heels give you more balance with your slide. Customers have complimented the Ram’s slide, making them an ideal shoe to help your game. There is a mild break-in period on the soles; until then, they can feel a little too slippery. Although the Pyramid Men’s Ram Bowling Shoes have a comfortable insole, there is little arch support. 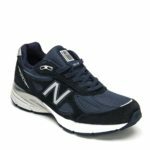 They run true to size, but they are ideal for men with narrow feet with low to medium arches. Dexter Jack Bowling Shoes are the perfect pair for bowlers who hate the appearance of classic bowling shoes. Styled as an athletic shoe, the Dexter Jack Bowling Shoe has a synthetic upper with stripes and stitching to give it a sporty appeal. Lined with soft material, the shoe’s padded collar and tongue make the shoe more comfortable for long games. Ideal for lefties or righties, the universal microfiber felt soles create the slide that bowling shoes need for you to throw your perfect match. Bowlers rave about the Dexter Jack’s comfort: there is no break-in period on this budget-friendly shoe, and the insoles feel similar to a running shoe. The Dexter Jack Bowling Shoe runs narrow, so you will have to order up a size if you have wide feet. 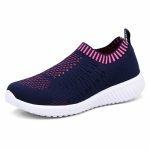 Although the shoe is comfortable out of the box, the synthetic upper does take some time to stretch to your feet. Some have complained that the slide isn’t as smooth as it could be, but this improves with time. Also, the felt doesn’t reach the edge of the toe, which is a source of irritation to some bowlers. Despite some issues with the slide, the Dexter Jack Bowling Shoes are an excellent budget-friendly shoe that professional and amateur bowlers alike can enjoy. Many amateur bowlers may not realize how much their footwear impacts their game. Choosing a comfortable shoe with the perfect slide can make the difference between throwing a spare or a strike. Our favorite men’s bowling shoe is the Brunswick Men’s Warrior. 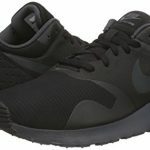 The company’s history in manufacturing quality footwear speaks for itself, and the Warriors are comfortable and lightweight. They are durable shoes that players of any skill can appreciate.